Monitoring efforts help track revitalization of this species. Michigan’s osprey population – nearly absent from much of the state due to the effects of DDT, other pesticide use and habitat loss – continues to rebound. In southern Michigan, monitoring efforts are in place to track the revitalization of this species. 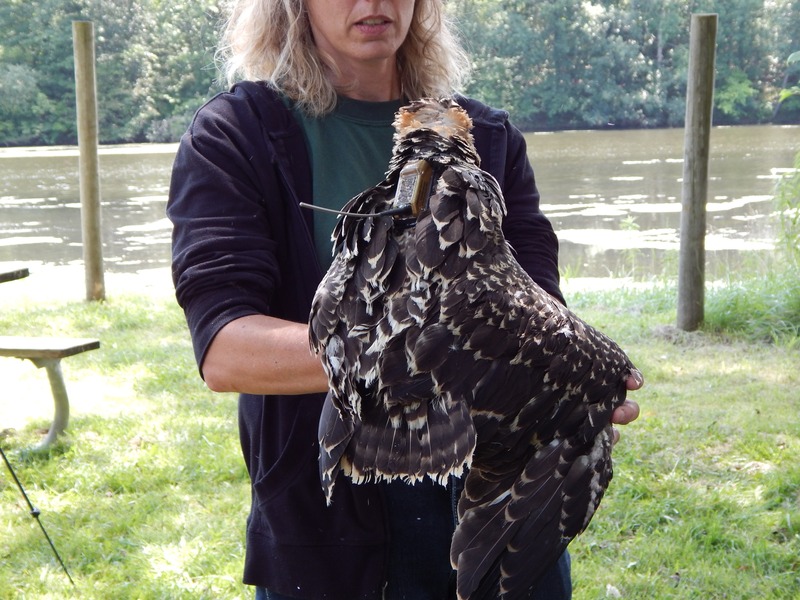 This year, four osprey chicks from area nests were outfitted with “backpack” GPS telemetry units funded by DTE Energy, Huron Valley Audubon, Lou Waldock and Michigan Osprey member Barb Jensen. The GPS backpacks help scientists track the young birds’ daily movements and seasonal migration patterns. The chicks were hatched on platforms at Michigan State University’s Lux Arbor Reserve in Delton, at Kensington Metropark in Milford and on Fletcher’s Pond near Alpena. One of those perils is predators like great horned owls. Just a few days after the transmitter was placed on the Kensington Metropark osprey chick, the youngster became prey, probably for a great horned owl. The backpack was retrieved and will be used again next year. Approximately 60 percent of the osprey chicks hatched each year do not make it to their second birthday. Factors that commonly cause mortality in young chicks include predation, collisions with buildings and other structures, weather, and shooting of birds in Latin America. Fortunately, a chick that was outfitted with a backpack in 2014 returned to the Midwest in 2016. Ozzie, a young female chick that hatched at Pointe Mouillee State Game Area, spent two winters in Colombia before returning to the U.S. and spent last summer in West Virginia. The exciting part is that anyone can follow along and find out where the birds have been just by looking at the Michigan Osprey website – www.michiganosprey.org. Move the cursor along the route to see GPS coordinates and time and date information for each leg of the osprey’s journey. The youngsters will begin their migration in early to mid-September, so log on to watch their travels. In 1998, the Michigan Department of Natural Resources began to relocate ospreys to southern Michigan. The program, supported by donations to Michigan's Nongame Wildlife Fund, removed chicks from active nests in northern Michigan and reared them in man-made towers in southern Michigan, a process called “hacking.” Relocation efforts occurred over a span of 10 years. 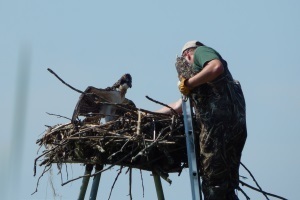 In 2016, the DNR, along with volunteers from Michigan Osprey, identified at least 60 active nests in southern Michigan – a substantial increase from the single active nest reported in 2002. "This is a true wildlife success story," said Oakes. "Each year we have new nests, and we have already exceeded our original goal of 30 active nests by 2020. We have been able to remove ospreys from the threatened species list to a species of special concern and restore their numbers in Michigan." Partners in this tracking and monitoring project include the Michigan DNR, the U.S. Department of Agriculture Wildlife Services National Wildlife Research Center, Huron Clinton Metroparks, the Detroit Zoological Society, Michigan Osprey and the Huron Valley Audubon Society. Anyone who observes a nesting pair of osprey in southern Michigan is asked to report the sighting to Michigan Osprey online at www.michiganosprey.org. /Note to editors: Accompanying photos are available below for download, Suggested captions follow. Boat: Biologists boat to the osprey platform at Michigan State University’s Lux Arbor Reserve. Osprey retrieval: DNR wildlife biologist Ken Kesson climbs up to retrieve the osprey chick that will receive the backpack. Animal and Plant Health Inspection Service and Ken Kesson of the Michigan DNR outfit the osprey chick with its GPS backpack while veterinary staff members from the Binder Park Zoo monitor the bird’s health. 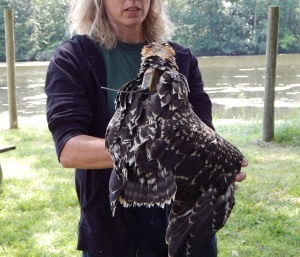 Osprey with backpack: Julie Oakes, a DNR wildlife biologist, holds the osprey chick with its new GPS backpack.